Hey all, as all of you know, October is the month if lots of Festivities. The first festival to mark the onset of all the other celebrations is Karwa Chauth. This special day celebrates the love and harmony between the life partners. Women fast all day long for a long and healthy life of their husband. Each year, my husband gifts me something or the other to make me feel special. This year around, I have decided to surprise him with a gift for him! 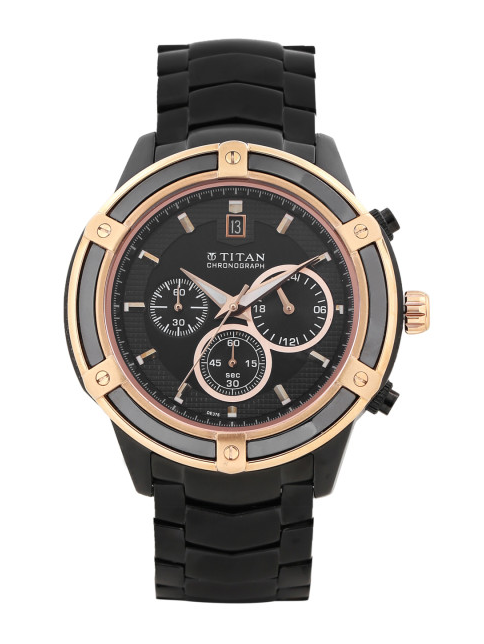 After hunting for a lot of options, I decided to gift him a Titan watch. 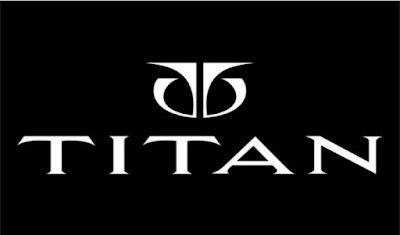 I always prefer Titan watches over international brand because I have always had great experience with Titan timepieces. It is at times; impossible to spot a fake international brand watches these days. Since, I am working six days a week, roaming around in malls and showrooms is not possible for me. Therefore, I mostly opt for online shopping. An elegant watch, as per me would make for a good gift for my hubby on Karwa Chauth as it is a useful and practical gift which he can wear every day, as a reminder of my love for him. 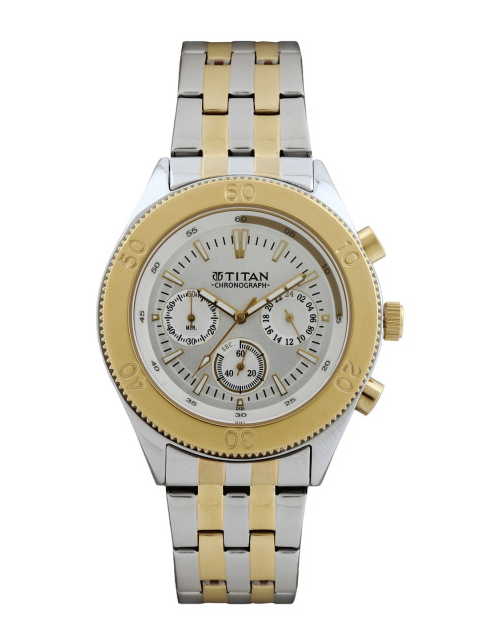 Myntra is one online shopping portal that provides you a number choice for trendy and classic watches. The discounts being offered right now on watches are insane! I searched a lots of watches online and shortlisted these two for my hubby. However, I am going to order one. I admit the first one is the one, I am more inclined towards. I love this one because it has a very versatile look. 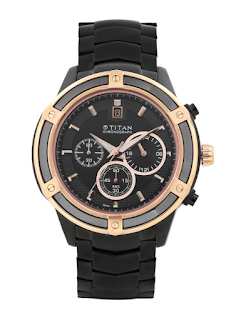 The strap is made in fine quality rubber that renders this timepiece a rather sporty look. The analogue dial looks classy and the Rose Gold dial is extremely stylish, too. It has a Three-faced chronograph display, a date aperture, two push-buttons and a screw to adjust the time and features. It is priced at INR 15495 but right now, Myntra is offering an awesome festive discount and selling the watch at INR 13170 with 2 years warranty. This one is priced at Rs. 7995. I like this because it is a classic colour combination of Golden and Silver. It has a bracelet style strap with fold over clasp. 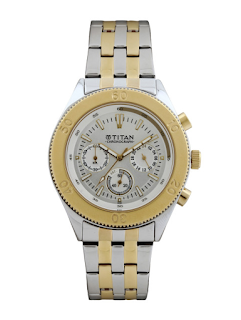 This too is analogue with a three-faced chronograph display, two push buttons to reset the features. I have shortlisted both analogues as my husband does not prefer digital watches, much. If there are any husbands reading this post, you too can gift a beautiful wrist watch to your wife from the ever so beautiful Titan raga range. All the watches in this collection are elegant and very feminine. I am pretty sure your wife would love those!